Yeast extract-Fermentation-Yeast extract-Fermentation-Yeast extract-Fermentation and others-Products and services-Shandong SunKeen Biological Engineering Co., Ltd.
Sunkeen yeast extract is refined from purified high protein yeast by modern biological engineering technologies such as specific process autolysis enzymolysis, vacuum concentration and spray drying according to nutrition needs of multiple microelement fermentation and is rich in amino acid, protein, nucleic acid, vitamins and microelements that are needed by microelement growth and metabolism. With a wide range of nutrients, reasonable proportion of ingredients and high solubility, it is an ideal raw material of biological culture medium in such biological industries as biological fermentation, biological medicine, food industry and biological agriculture. Safety and reliability: Bio Sunkeen yeast extract is made from purified yeast and is free from transgenosis, allergen and custom taboo. It passes KOSHER and HALLA certifications. 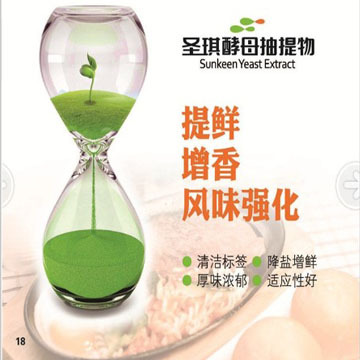 High yield rate: Bio Sunkeen produces various yeast extracts and other culture mediums featuring good solubility and high yield rate by applying yeast directional hydrolysis technology based on different fermentation needs of customers. Stable quality: cultivation of pure yeast materials, large-scale production, full-automatic control and comprehensive quality management system. Clean and environment-friendly: light product color, high biological utilization, few fermentation residues and contribution to product purification and environment-friendly post-treatment. Widely applied to fermentation industries including amino acid, organic acid, enzymic preparations, biological medicine, polysaccharide, antibiotics, biological preservatives, probiotics, biological materials, vaccine and environmental engineering.